Manchester City head into the last match of the season with a two point lead and a vastly superior goal difference compared to second place Liverpool. A draw vs. West Ham on Sunday would be enough to win the title. 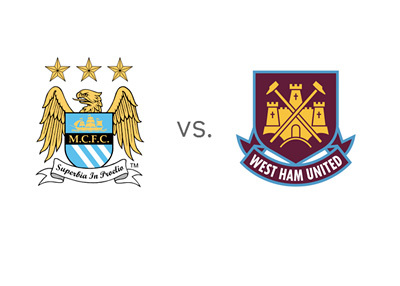 Manchester City are coming off an emphatic victory vs. Aston Villa on Wednesday. Their winning streak is now extended to four games. Villa defended well in the first half, but the dam finally broke in the 64th minute and City were able to finish the game off with an impressive 4-0 scoreline. Yaya Toure's goal in the 93rd minute was something special. After losing to Crystal Palace and West Brom, West Ham most recently beat Tottenham 2-0 at Upton Park. Sam Allardyce's team are currently in twelfth place in the EPL tables. West Ham have received the most press this season when they 'parked the bus' on their visit to Stamford Bridge, where they held Chelsea to a goalless draw. Manchester City are the huge favourites to win this one at home and claim their second title in the last three years Edin Dzeko has been in fine form for City lately and he is the favourite to score on Sunday at 8/13. When the two teams met earlier in the season, Manchester City won the match with the score of 1-3. Manuel Pellegrini's team performs best when they attack and they will probably do just that in the last game of the season. The big question is how West Ham will approach this game. Will the choose to all-out defend or will they try and get something out of this game? This could be either a very tense or a very entertaining game. Manchester City are now the 1/50 favourites to win the English Premier League, according to the betting odds.